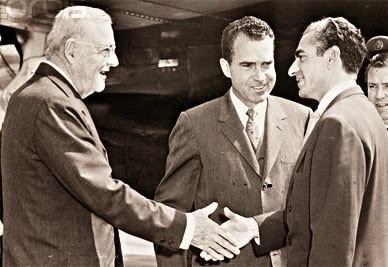 Secretary of State John Foster Dulles and Vice President Richard M. Nixon greet the Shah Mohammad Reza Pahlavi in Washington, D.C. It remains bizarre that, for years, certain agenda-driven scholars attempted to suggest that the United States had, at best, a middling or minor role in orchestrating the 1953 coup that overthrew popular nationalist Iranian Prime Minister Mohammad Mossadegh. For instance, in a 2010 column in the Washington Post, Council on Foreign Relations fellow Ray Takeyh - a veritable font of nonsense - described the 1953 coup as "one of the most mythologized events in history," arguing that "[t]he CIA's role in Mossadeq's demise was largely inconsequential" and that the real power of the overthrow lay in the hands of Iran's "clerical estate" or, as he likes to call them, "the mullahs." Despite the fact that American culpability has been clear for decades, and pushback to his claims was swift, Takeyh wrote effectively the same piece for the Weekly Standard three years later in the hopes that a more concentrated reactionary and Islamophobic audience would be receptive to his revisionist history. This time around, Takeyh claimed that "Operation Ajax—the notorious CIA plot that is supposed to have ousted Iranian prime minister Muhammad Mossadeq" was merely "mythologized history" and that - this might sound familar - "the CIA’s role in Mossadeq’s demise was largely inconsequential." Rather than what he dismissively describes as the narrative of a "nefarious U.S. conspiracy," Takeyh declares that "the 1953 coup was very much an Iranian affair." Takeyh published that on June 17, 2013. Almost exactly two months later, on August 18, an internal CIA report was released to the public openly acknowledging the U.S. (and British) governments' responsibility for the coup, thus rendering Takeyh's disinformation even more absurd. "[T]he military coup that overthrew Mosadeq and his National Front cabinet was carried out under CIA direction as an act of U.S. foreign policy, conceived and approved at the highest levels of government," the document, written in the mid-1970s, states. The supposed threat of "Soviet aggression," it continues, "compelled the United States... in planning and executing TPAJAX," the intelligence agency's codename for the overthrow operation, "as a last resort." The plot was authorized by President Dwight D. Eisenhower at the behest of Secretary of State John Foster Dulles, whose brother, Allen Dulles, was then the Director of the Central Intelligence Agency, and carried out by CIA operatives Kermit Roosevelt, Jr. and Donald Wilber. It is often noted that no U.S. government official had admitted American responsibility for the coup until March 2000, when then-Secretary of State Madeleine Albright said, "The coup was clearly a setback for Iran's political development, and it is easy to see now why many Iranians continue to resent this intervention by America in their internal affairs." Years later, on June 4, 2009, before an audience at the American University in Cairo, President Barack Obama acknowledged, "In the middle of the Cold War, the United States played a role in the overthrow of a democratically elected Iranian government." In September 2013, Obama noted Iranian anger over "America's role in overthrowing an Iranian government during the Cold War." More than two decades earlier, however, in May 1991, a figure much closer to the fateful events of August 1953 spoke openly of the Eisenhower administration's direct involvement and praised the decision unequivocally. Former President Richard Nixon, in a conversation with C-SPAN about the legacy of President Dwight Eisenhower under whom he served as Vice President for two terms, discussed the American role in the 1953 coup. "The United States, together with Britain, participated in supporting a coup in Iran that got rid of Mossadegh," said Nixon, who then described the former Iranian Prime Minister as "a left-leaning, Soviet - frankly - controlled leader." Nixon defended the coup because, in his words, "By restoring the Shah to power, it meant that the United States had a friend in Iran, a very strong friend, and for 25 years Iran played a role as a peace-keeper in the Persian Gulf area." He then cited, as an example of the benefits of the coup, the Shah's continued willingness to ship oil to Israel during the Yom Kippur War in 1973. "That would not have happened if Mossadegh, the one that the CIA got thrown out, had been in power," Nixon said. "It happened because Eisenhower, in his wisdom, did support those forces that restored the Shah." 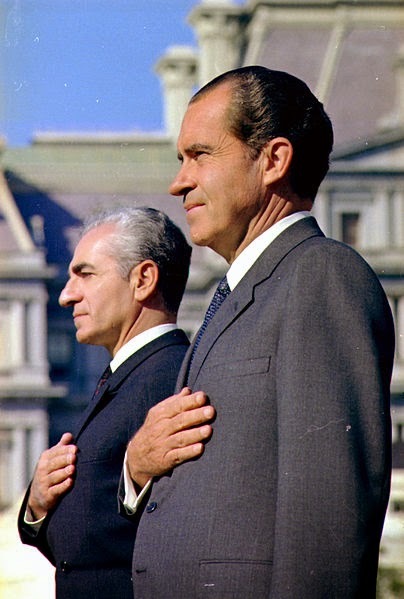 Nixon was a staunch believer in the Shah's suitability as a regional policeman and facilitator for U.S. interests in the Middle East and visited Iran as Vice President shortly after the coup. As president, Nixon began providing weapons systems and military assistance to the Iran on a grand scale, effectively bankrolling the Shah's $20 billion military build-up in the late 1960s and through the next decade. "[W]e adopted a policy which provides, in effect, that we will accede to any of the Shah’s requests for arms purchases from us (other than some sophisticated advanced technology armaments and with the very important exception, of course, of any nuclear weapons capability)," recalled Nixon's National Security Advisor Henry Kissinger. The role of the United States in overthrowing Mossadegh is undeniable. What remains in doubt is the credibility of commentators like Ray Takeyh, who have long produced faulty analysis, presented false history as fact, and yet retain their inexplicable reputation in the establishment media and halls of government as someone worth listening to. When a criminal and a liar like Nixon is more trustworthy than an "expert" like Takeyh, it's no wonder both the public and our politicians remain so outrageously misinformed when it comes to Iran. Another recent development that we helped bring about was the restoration of the Shah to power in Iran and the elimination of Mossadegh. The things we did were "covert." If knowledge of them became public, we would not only be embarrassed in that region, but our chances to do anything of like nature in the future would almost totally disappear. Eisenhower also praised an unnamed CIA agent - Kermit Roosevelt, Jr. - for his vital role in the coup's success. "Nevertheless our agent there, a member of the CIA, worked intelligently, courageously, and tirelessly," wrote Eisenhower, adding that, considering how the coup attempt initially appeared in jeopardy, "we can understand exactly how courageous our agent was in staying right on the job and continuing to work until he reversed the entire situation." June 22, 2014 - Ray Takeyh is back at it, writing in Foreign Affairs - the journal of the Council on Foreign Relations, where Takeyh is a senior fellow - that "[t]he history of the U.S. role in Iran’s 1953" is "not well founded" and again insists that "the clergy itself played a major role in toppling Mosaddeq." "In reality," Takeyh maintains, "the CIA's impact on the events of 1953 was ultimately insignificant." Takeyh, in his never-ending attempt to promote revisionist history absolving the United States for its culpability in the coup, also happens to conveniently omit from his tome the fact that then-CIA head Allen Dulles, was also a longtime director of the Council on Foreign Relations, was its secretary from 1933 to 1944, and its president from 1946–50. Later this summer, as Steve Aftergood has revealed, the U.S. State Department will be "publishing a supplemental volume of declassified documents in its Foreign Relations of the United States (FRUS) series that is expected to fill in the missing pieces of the documentary record of the 1953 coup against the Mossadeq government of Iran." June 29, 2014 - A new release of declassified CIA documents, obtained by George Washington University's invaluable National Security Archive, sheds some more light on the 1953 coup, notably internal agency dissent over the operation, as well as the clearest official admission to date of British involvement in the coup. On August 16, 1953, the same day the Shah of Iran fled to Baghdad after a failed attempt to oust Prime Minister Mohammad Mosaddeq, the agitated monarch spoke candidly about his unsettling experience to the U.S. ambassador to Iraq. In a highly classified cable to Washington, the ambassador reported: "I found Shah worn from three sleepless nights, puzzled by turn of events, but with no (repeat no) bitterness toward Americans who had urged and planned action. I suggested for his prestige in Iran he never indicate that any foreigner had had a part in recent events. He agreed." September 3, 2014 - In Foreign Affairs, Christopher de Bellaigue, a Tehran-based journalist and author of the book, Patriot of Persia: Muhammad Mossadegh and a Tragic Anglo-American Coup, challenges Takeyh's promotion of what he calls "discredited myths" and "selective history." "Takeyh," de Bellaigue writes, "adduces no evidence to support his claim that without the CIA's involvement, the events of 1953 would have ended in the same result." In response, Takeyh repeats the same claims he's made endlessly, adding nothing new to what he's previously written. Instead of rehashing his argument here, I suggest you just read this instead. December 18, 2014 - The U.S. State Department has once again delayed the release of declassified documents covering clandestine American actions in Iran during the 1950s - ostensibly for fear they would undermine progress already made during nuclear negotiations and poison the well of good faith. The U.S. Department of State has blocked the publication of a long-awaited documentary history of U.S. covert action in Iran in the 1950s out of concern that its release could adversely affect ongoing negotiations over Iran’s nuclear program. The controversial Iran history volume, part of the official Foreign Relations of the United States (FRUS) series, had been slated for release last summer. (“History of 1953 CIA Covert Action in Iran to be Published,” Secrecy News, April 16, 2014). But senior State Department officials “decided to delay publication because of ongoing negotiations with Iran,” according to the minutes of a September 8, 2014 meeting of the Advisory Committee on Historical Diplomatic Documentation that were posted on the Department of State website this week. “The logic, as I understand it, is that the release of the volume could aggravate anti-U.S. sentiment in Iran and thereby diminish the prospects of the nuclear negotiations reaching a settlement,” said Prof. Richard H. Immerman, a historian at Temple University and the chair of the State Department Historical Advisory Committee. Besides, if the documents do have an occult power to shape events, maybe that power could be harnessed to constructive ends. “I would argue that our government’s commitment to transparency as signaled by the release of this volume could have a transformative effect on the negotiations, and that effect would increase the likelihood of a settlement,” Prof. Immerman suggested. “At least some in the Iranian government would applaud this openness and seek to reciprocate. Further, the State Department of 2014 would distinguish this administration from the ‘Great Satan’ image of 1953 and after,” he said. Continued secrecy has become an unnecessary obstacle to the development of US-Iran relations, argued historian Roham Alvandi in a similar vein in a New York Times op-ed (“Open the Files on the Iran Coup,” July 9, 2014). Really proud of you Nima. Excellent article. It just goes to prove sadly that some Iranians are more Zionist then Zionists themselves, or are being nicely paid to spread disinformation. At 24 min: “In 1953 when we had a problem with Iran — the Mossadeqh government had nationalized oil — the CIA was able to overthrow Mossadeqh in a secret coup; put the shah of Iran, who was a young man, in power and have an American ally for 20-some years, until 1979, and that only cost $3 million! We owned that country, in a sense, through the shah and having supported him. There was big blowback to pay, but it only cost America $3 million! Iran today, you look at what we’re trying to do with sanctions today, it’s costing America billions of dollars, those sanctions, and we haven’t deterred Iran, we haven’t overthrown the government. Ah, Alireza, one of my most reliable trolls, I mean, readers. Welcome back, friend. The articles linked to above - two from the same vitriolic blog, two by Abbas Milani - are precisely the type of commentary I was referring to in the very first line of my post, so thank you for bringing those to everyone's attention. Regarding Milani's claims and scholarship, readers may also wish to check out Arash Norouzi's extensive analysis of Milani's "The Great Satan Myth." Thanks for the welcome, Nima-yeh aziz! The good thing is that people can read and decide for themselves whether "vitriolic" individuals and historians who actually speak and can read Persian are more credible sources than those who don't. P.S. I had never heard of Arash Norouzi before, but a google search of his name gives some indication of his credibility and knowledge as a specialist on Iranian history. Nima lives in Brooklyn and thinks he knows Iran because a couple of his buddies re-tweet his posts. He has no idea and he writes with such confidence on Iran that its almost amusing. If he devoted 1% of his criticisms towards Iran's government as he does towards Israel, maybe we'd consider him "fair". But he's not. Hey Arash and Alireza, it is very trollish and narrow-minded of you to dismiss the realities of documents published by CIA and commentaries made by US authorities on op Ajax. Now you should ask yourself what evidence you need to believe that CIA had a direct major role in it? when CIA itself admits it what on earth Milani has to add? We don't need mullahs to destroy our country as long as rigid-minded people like you are trolling by. Well-done Nima. Although thick heads are quite impermeable to facts.